While many parts of your landscape are easy to understand, sprinkler systems have a lot going on that may not be obvious to the casual observer. We’ve spoken with the experts to find out what you need to know to understand sprinkler systems and feel confident choosing the right contractor for the job. Some homeowners' associations or city planning offices will require irrigation plans that have been prepared by a professional. Professional irrigation or sprinkler plans can be as simple as a plot map (top view of the property drawn to scale) showing valve zoning only, or as complex as a head-to-head sprinkler plan detailing head location, spacing, nozzle pattern, and gallons of flow per minute head calculations. Here is an example of a professional irrigation plan (click image below to enlarge). When to choose a sprinkler system vs. a drip systemSprinkler systems have heads that spray large quantities of water over an entire area. They’re best for spots that have a single type of low-growing plant, such as lawns or areas with groundcover, because the sprinkler heads provide uniform coverage. Drip irrigation systems are best used in areas that have mixed plantings of shrubs and perennials. Because a drip system provides a slow drip of water at the base of each plant, the system can be tailored to the needs of the individual plants. A water-loving plant can be given more water, while water-conserving plants can be given little to none. Get tips on using risers to prevent sprinkler lines from getting damaged. Mark location of existing gas, electric, and water lines. “Before any digging occurs, the installing contractor must have a complete understanding of where existing lines are located,” says Rick Evans, owner of Aesthetic Gardens in Mountain View, CA. Call 811 from anywhere in the US, and within a few days they’ll send a locator to mark the approximate location of lines, pipes and cables so your contractor can dig safely. Use machinery to create trenches. In order to put the pipe underground, your contractor will need to dig trenches around the area to be watered. They may use a trencher, skid steer, Ditch Witch, or a shovel where precision is needed. Lay pipe in trenches. The pipe will generally be placed about 15-18” underground. This makes it less likely to get damaged in the course of ordinary gardening. Install valves. The irrigation valve turns the water for each zone on and off when it gets the signal from the timer. Most home landscapes have multiple zones, so each section of the landscape is watered in turn to ensure the water pressure stays consistent in every area of the garden. Attach sprinkler heads. The sprinkler heads are connected to the PVC pipe. The heads should be nearly level with the finished soil grade. If they’re placed too high, the heads can be damaged when mowing. If they’re placed too low, they can become covered or clogged by turf and soil. Connect wiring and timer. The timer is the control panel we use to set how often and how long our system runs. One timer can control both sprinkler and drip irrigation systems. The timer needs to be wired to the valve system so it can tell the valves to turn on and off. It’s usually attached to the home and is either hard-wired to the home’s electrical system, or is plugged into an outlet. Test system thoroughly. Once everything is in place, your contractor will want to test the system to be sure that there are no leaks and that your landscape is getting even coverage. Fill in trenches and re-seed lawn. During the cleanup phase, your contractor will fill any open trenches with topsoil, level the soil, and re-seed lawn. If any garden beds were trenched, they will likewise be filled in with good-quality soil, mulched, and restored to their original beauty. How long does a sprinkler installation take?While the amount of time your irrigation project will take depends on the size of your garden and the complexity of the project, on average, sprinkler installations take 3-4 days per acre of lawn and drip. “Because the amount of time it takes to complete a project will vary,” Evans says, “the installation contract needs to specify a start date and a completion date so you know what to expect." What issues make a sprinkler installation more challenging?Hard water may call for a filter. The minerals in hard water can cause crust and minerals to form on valves, backflow preventers, and more. If you have hard water or are using well water, a filtration system is often a good investment. Poor soil can make trenching difficult. 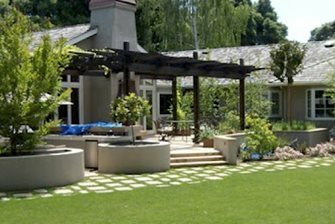 “Sandy soil is a challenge because it fills in almost as fast as we can trench,” says Andy Villaescusa, owner of A-Plus Sprinkler and Landscape in Crestline, CA. “Rocky soil is obviously tough because it can break machinery and make digging difficult.” Either way, your contractor will check your soil quality prior to providing a bid. Good flow and pressure are critical. 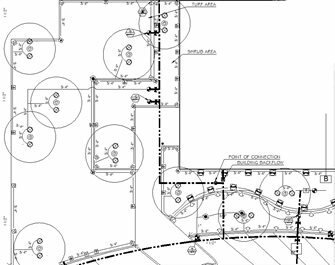 Before designing a sprinkler plan, your contractor will check your water flow and pressure to make sure they can bring water to all areas of the landscape. If there’s not enough flow, your contractor may install a 500-gallon cistern which can fill slowly to provide enough water for the system to run. Lack of pressure can be dealt with by increasing the size of the main water line or by adding a pressure pump. How to hire for your irrigation installation“When you’re allowing a stranger into your home, business, or financial life, you need to know as much about them as possible,” says Evans. It’s worth taking the time to confirm your contractor has the basics in place, such as their contractor’s license, bonding, liability insurance, and worker’s compensation insurance. You should also ask for and check their references to find out how they did on similar projects. Lastly, don’t let familiarity lower your standards for a professional installation. “While your gardener may be great at trimming shrubs, they often know just enough about irrigation to be dangerous,” says Villaescusa. Hiring an experienced, licensed landscape contractor is the best way of ensuring your irrigation system will run effectively for years to come.